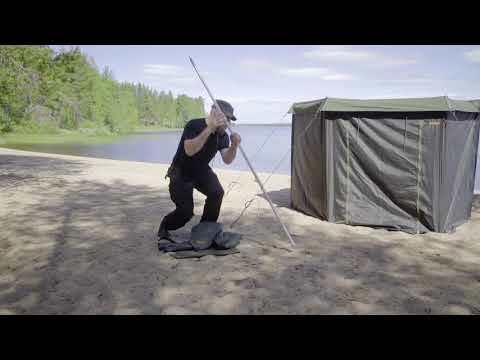 The Savotta small sauna tent is a convenient mobile sauna for any occasion. It functions the same way as any conventional sauna typically used in Finland. It has an oven with a stone-rack and a chimney that is designed with fire safety in mind. Due to its small size, it is portable in most situations. The weight of the sauna set is 24 kg with the sauna and oven. A typical set of “Sauna Stones” is roughly 20kg so the total weight is commonly around 45 kg. Due to its compact size, the sauna can be transported in boats, canoes, sledges, caravans, back-seat of a car or even a framed rucksack like the Savotta 906 rucksack. The Savotta small sauna tent can be assembled by one person and does not require any training for doing so. It can be carried to the site easily and then assembled within half an hour. The set contains a tent fabric, set of tent poles and stakes, oven with a chimney and a stone rack for sauna stones. The oven is made of steel and has a long lifetime as it is hand crafted like most of Savotta products. It has the lightweight chimney packed inside and has attachable legs so it is more suitable for transport. Savotta small sauna tent has room for roughly 3 – 5 persons. It measures 2 meters in height and is about 2,2 meters wide. As the tent is equipped with strings to make the construction firm during wind gusts, the area used for placement of the tent is roughly 3,5 x 3,5 meters. Weight of the tent ca. 6kg. Weight of the oven ca. 18kg.